There are dozens of trading indicators out there. But among them, there’re a few that stand out as exclusive intraday trading tools. And the volume-weighted average price (VWAP) is the best-known example. 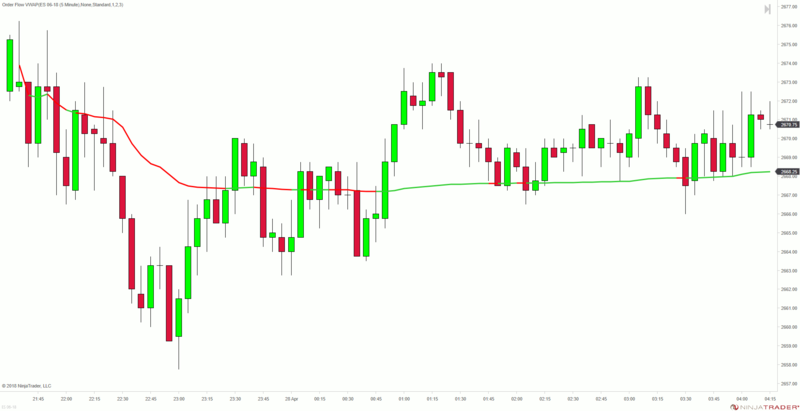 This guide aims to introduce you to this nifty intraday trading tool. It is calculated cumulatively, accounting for the volume traded as the session progresses. For this reason, you do not need to choose a lookback period. Click here for a detailed VWAP calculation example. Used to measure trading efficiency for large institutional orders. For instance, you manage to execute a buy order at an average price below the end-of-day VWAP. Then, you’ve enjoyed a better than average price. More sensitive to price and volume changes at the beginning of the session. Becomes less responsive as the session progresses. Due to this progressive lag, the VWAP might not be appropriate for timing market entries. Then what is the VWAP good for? It is a valuable tool that reduces market noise and illuminates price bias. This indicator incorporates both the price and volume of each session. Hence, it’s a handy benchmark for judging the market bias. 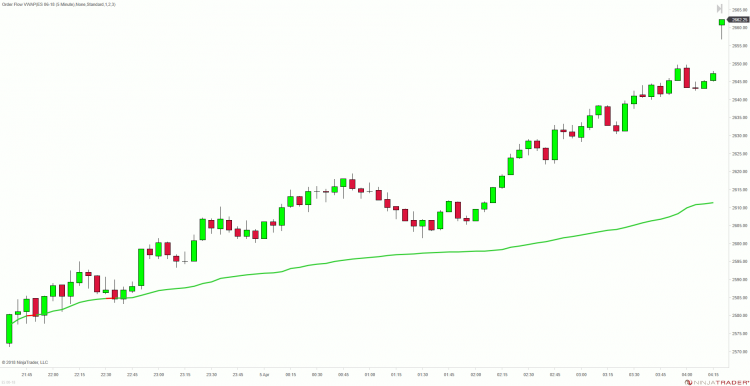 Take a look at the intraday charts below. For bullish trend days, the market stays mostly above the VWAP. For bearish trend days, the market stays mostly below the VWAP. For ranging sessions, the market stays mostly around the VWAP which remains more or less flat. These observations show that the VWAP has great potential for helping traders identify the market tide. Here, you’ll learn a method that you can apply immediately to your intraday trading. Step 2: Observe if that push enjoys follow-through or is rejected back to the VWAP level. If the thrust away from the VWAP enjoys follow-through, assume a trending session. You can then consider momentum trades in the direction of the trend. If the market rejects the price thrust back to the VWAP, assume a sideways session. Consider taking mean-reversion trades in this case. This example also demonstrates why the VWAP might be ill-suited for timing entries. For instance, if you intend to trade pullbacks to the VWAP, you will not get a chance to join this splendid bull run. 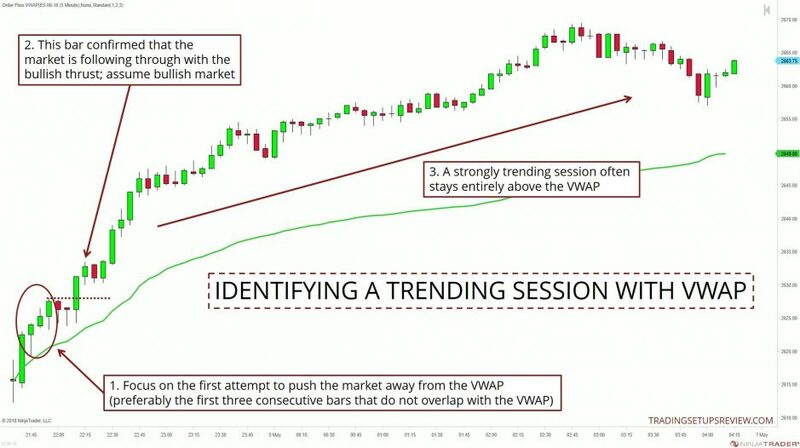 In fact, if you’re convinced that a powerful trend is unfolding in front of you, don’t wait for a specific setup. Simply enter with a one-bar pullback and place a volatility stop to limit your risk. When the market fails to move away from the VWAP, the likelihood of a ranging session increases. Paying attention to the slope of the VWAP yields useful information. In the trending session example, the slope stayed positive throughout the session. On the other hand, a relatively flat slope means that there’s not much trending action. At the beginning of each session, the price bars tend to overlap with the VWAP. According to our method here, you cannot judge the market bias until the market tries to move away from it. Hence, you should stay out of the market until prices diverge sufficiently from the VWAP. This means sitting on your hands around the session open. This technique ties in neatly with the standard advice of staying out of the market for the first 15 or 30 minutes. Except that the VWAP tells you when it’s okay to consider an entry, rather than prescribing an arbitrary no-trade period. As this is a beginner guide, we chose to focus on clean and neat examples above. 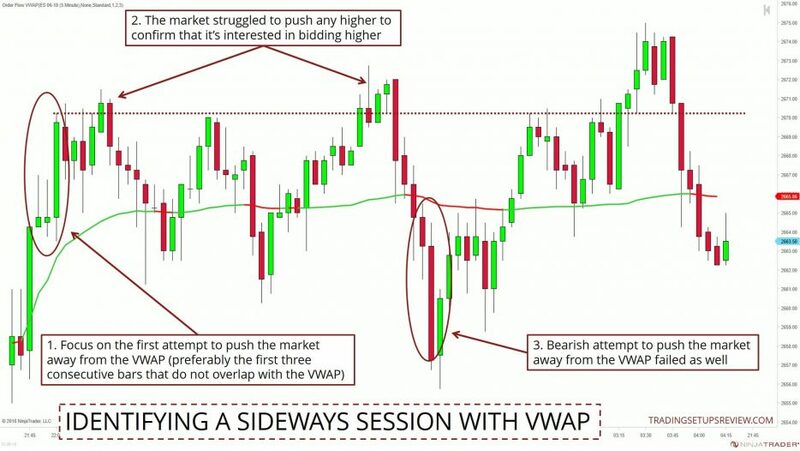 As you try to apply the VWAP on your charts, you will inevitably find messier price action. In such cases, take your time to observe patiently, and you’ll gain greater insights on its usage. Once you’re comfortable with the basics, you can explore more advanced aspects of the VWAP. Below are some handy resources. VWAP bands are lines above and below the VWAP projected with multiples of the standard deviation. Think of it as Bollinger Bands with the VWAP as the middle band. The VWAP only works with intraday data. If you want a similar tool that works on daily and above time frames, check out the MIDAS trading framework. 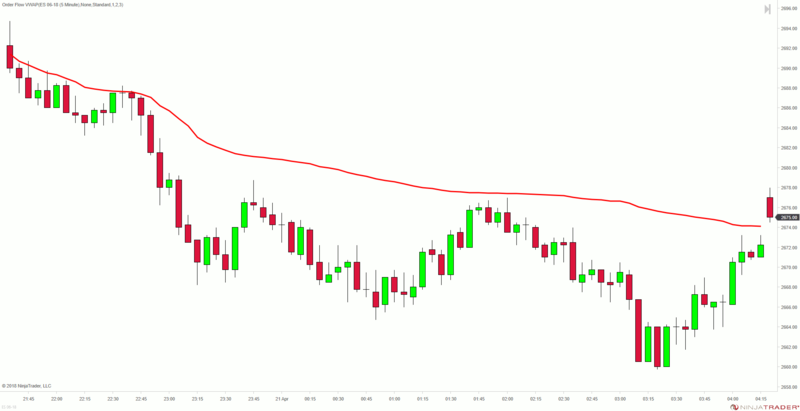 The VWAP opens exciting possibilities for developing and evaluating intraday trading algorithms. 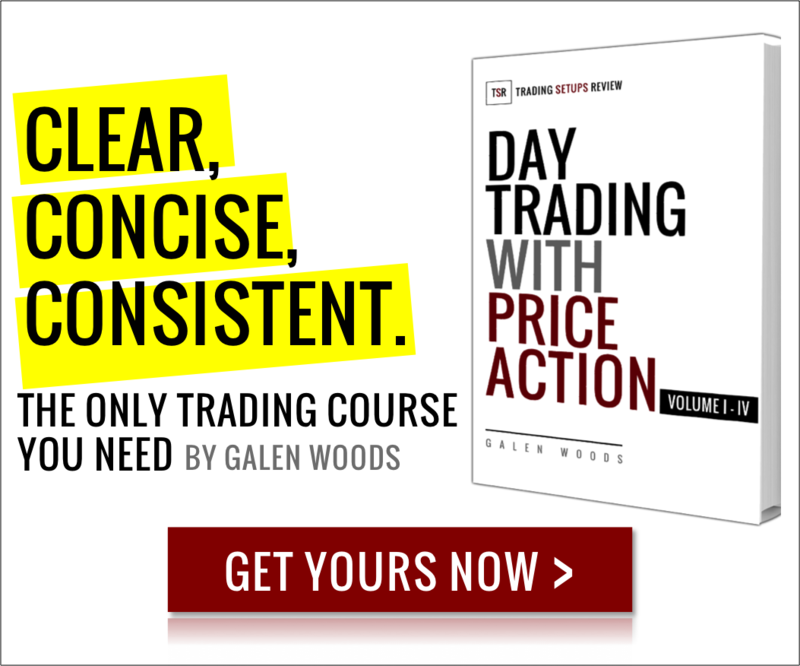 If you’re new to systems trading, check out these affordable courses to get started. The VWAP might not be available on all charting platforms. What parameters you used in the above charts for vwap? It’s 15, 20, 233? Hi, the VWAP on its own does not require a parameter. As mentioned in the article, It is calculated cumulatively, accounting for the volume traded as the session progresses. For this reason, you do not need to choose a lookback period/parameter. However, there are variations of VWAP (e.g. standard deviation bands plotted around it) that might require parameters.